Facebook Still Has No iPad App But They're Building A Desktop Software Team?! Facebook has no iPad app. It’s ridiculous. Their iPhone app is the most downloaded app in the history of apps. And third-party iPad apps (many of which aim to trick users) constantly dominate the top 10 lists for both free and paid apps. And yet, Facebook doesn’t seem to care at all about the device. Because they’re all about HTML5, right? Well, someone might want to tell the Seattle office that. On the jobs page for the relatively new Seattle Facebook office, one of the openings is for “Software Engineer, Desktop Software”. Desktop software. Desktop. Before the damn iPad. Hey Facebook, 1986 called, they want their strategic vision back. The desktop software team is a new team at Facebook based out of Seattle, WA. We will be working on new products that we expect to deliver to millions of users’ computers to help make their entire computing experience more social. 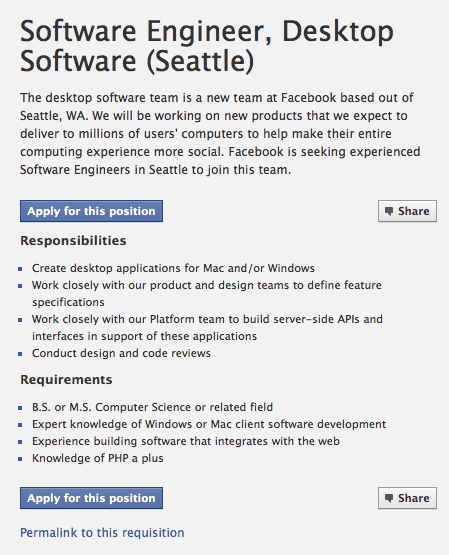 Facebook is seeking experienced Software Engineers in Seattle to join this team. The job asks for expertise in creating desktop applications for Mac and/or Windows (Linux fans can now revolt as well). Is Facebook actually building a full-fledged desktop app? If so, that’s awesome. But again, it doesn’t seem to make a lot of sense given their stated (over and over again) commitment to HTML5 and that being the key driver for why they don’t have an iPad app. Of course, I also don’t believe that they’re not actually building an iPad app. I think they just thought they could get away with not building one (remember “the iPad isn’t mobile” — but the desktop is?) and only more recently realized they should probably be on the fastest growing new computing platform in history. And then there’s the Facebook Phone project. Which totally doesn’t exist. Double pinkie swear (with fingers crossed behind the back). Or might this be about the Facebook Browser that I’ve been thinking about for a while? That might actually make a lot of sense. Interesting times for the social network. I just better see that damn iPad app before I see a desktop client.